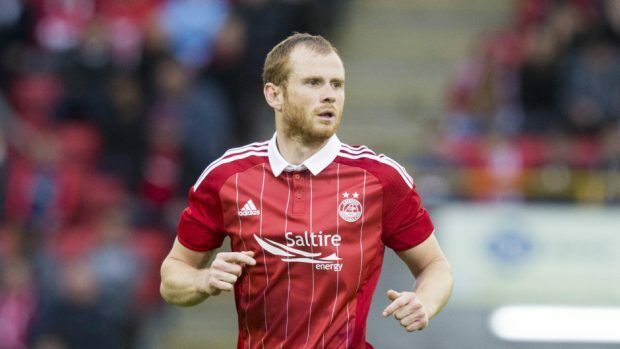 Aberdeen defender Mark Reynolds is desperate to avoid a repeat of four years ago when Motherwell pipped the Dons for second place on the final day of the season. A controversial injury-time goal from Craig Reid was enough for the Steelmen to clinch runners-up spot in 2014 with the Dons furious the goal was not chalked off for a foul on goalkeeper Jamie Langfield. Reynolds expects the race to finish second to go down to the wire with the Dons, Hibernian and Rangers locked in a three-way contest to finish best of the rest behind champions Celtic. Reynolds said: “It’s the first time there has been more than one team fighting to finish in the runners-up spot. “The Motherwell one was hard to take as we felt we had done enough to beat them to it that season. “But it was a head-to-head then while there is a couple of other teams pushing us all the way this time. “It’s more of a run-in whereas it was just a one-off game four years ago but we’ll try to not speak about that. The Dons are chasing a fourth successive second-place finish and are three points ahead of Rangers and Hibs ahead of Neil Lennon’s side visiting Pittodrie this weekend. Reynolds said: “This is the tightest it’s been since the manager has been at the club but the bonus is it’s in our own hands. “The key thing is we don’t need to look to anyone else to do us any favours and we just need to go out there and take care of business. “I’m sure people are fed up hearing about us taking it one game at a time but that is really how it is at Aberdeen. “If we take advantage of playing first as it puts the pressure on Hibs and Rangers for their games if we pick up three points. “It’s always nice to have the chance to do that so we can sit back and watch the other results coming in at the weekend. Aberdeen under-20s drew 2-2 with Hamilton Accies at Forfar’s Station Park in their penultimate SPFL Development League fixture. Miko Virtanen and Bruce Anderson were on target for the young Dons.